Did Mar Roxas receive leakage from ABS-CBN? MANILA, Philippines - Liberal Party standard bearer Mar Roxas II has been accused of receiving questions from ABS-CBN prior to the third presidential debates held on Sunday, April 24. Netizens ask ABS-CBN on alleged cheating during the debate. Photo screengrab from Youtube. According to netizens who alleged presidential debates host ABS-CBN of conspiring with Roxas, questions were apparently leaked as Roxas seemed more prepared compared to his opponents and was able to cite specific data and case studies. Moreover, netizens noted that Roxas received questions that built his character and reputation. “While Miriam Santiago groped for answers, many debate observers noticed how Mar answered the questions so eloquently with all the facts and figures to support his arguments and fitting the time allotted to him,” according to an article of a blogsite. Moreover, a certain Nylede Flores uploaded a video flashing the caption for Roxas’ statement which appeared just before he delivered it. The said video is no longer available as of this writing due to a copyright claim by ABS-CBN. In the video, a few seconds before Roxas stated: “Sa karanasan, binabangga ko ang mga malalaking interes…,” the caption: “Roxas: Binangga ko ang mga malalaking interes.” was displayed on screen. 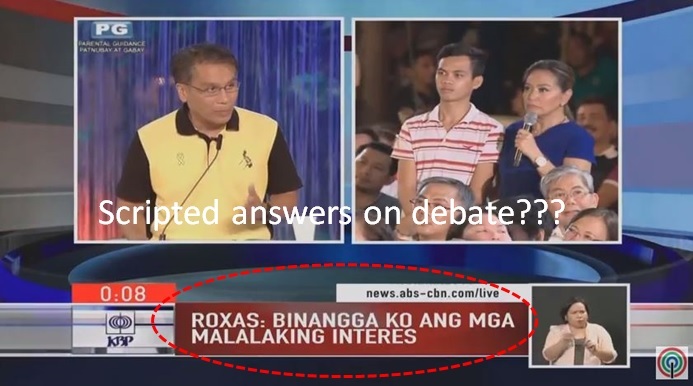 Critics of Roxas insisted that this would only be possible if the chargen operator received a copy of Roxas’ answers to the debate questions in advance. “So, what possibly happened was 1.) the Roxas camp was given a leak of the questions to be asked; 2) the Roxas camp prepared answers to the questions; 3) the prepared answers were given to the technical group handling the coverage thus allowing the chargen operator to type the blurbs and post these almost simultaneously with Roxas’ answers,” political writer and former North Cotabato governor Manny Piñol wrote on his Facebook page. However, an article for Fight for Mar dispelled netizens’ allegations that Roxas cheated during the presidential debate. “The video attached ONLY shows Mar saying it the second time as he concluded his statement. He started with the same phrase. It was only at the end when the text appeared,” the article said. Moreover, the article pointed out that Mar confidently answered the debate questions since he had discussed the same issues such as internet access, institutionalized scholarships, clean energy, justice system, transportation and other issues in the past. Do you think Mar Roxas was given questions prior to the debate? Watch the video replay (head over to 2:11:00 to 2:11:33). In a media briefing at Fontana Convention Center in Angeles, Pampanga on Monday, Roxas just laughed on the allegations and said it is too shallow. “Ganon na ba kababaw ang mga alegasyon ngayon? Parang leakage? Parang college? Kung sino man gumawa noon hindi ba kayo nahihiya?” Roxas said. Though his wife is working with ABS-CBN, he claimed that he did not feel a special treatment from the broadcast giant.